Divide the lettuce among four plates - 2 cups per plate. Arrange the apple slices, prosciutto, cheddar and walnuts on the lettuce beds. Dress with 1-2 tbsp vinaigrette per salad. Serve immediately. This is the final post in this week's Apple Series, following Homemade Applesauce, Homemade Apple Pie, and Loaded Apple Muffins. When my daughter saw me slicing apples for this apple salad the other day, she pulled up a stool and asked for a slice. And then another. And could she have that cube of cheese too? Smart girl. Apples and cheddars are a fabulous pairing. Apples are reaching their prime season right now ... juicy, crisp and perfect. Biting into one sprays you with a mist of sweet apple juice -- which is even better if they are chilled. It's blissful. Beyond just eating apples, I love thin slices of raw apples in salads. They add a lovely crunchy and sweetness to any dish. The salad I was making the other night was Apple, Prosciutto and Walnut Salad. Whisper thin slices of prosciutto are sliced into strips and served with apple slices, bits of walnut and cubes of cheddar (the sharper the better!) on a bed of Bibb lettuce with vinaigrette. It's a wonderful mix of flavors and textures: sweet and salty, creamy and crunchy. And the vinaigrette adds a nice element to the salad too. This is the kind of salad you might serve at a luncheon or whip up for a light dinner (just add some dinner rolls). You could also eat it with mini sandwiches for something a little more filling. Looking for more great apple salad recipes? 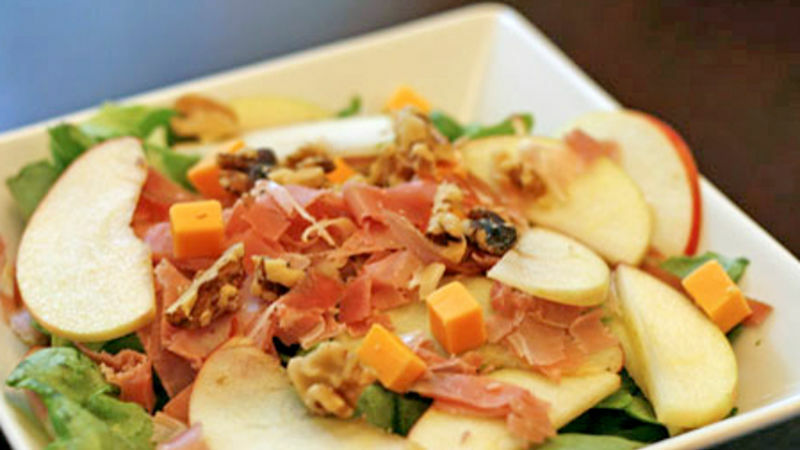 Do you have a favorite apple salad recipe? Share it in the comments below!